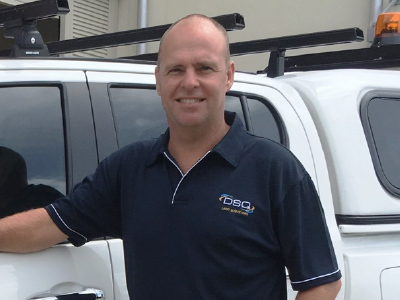 Tony graduated from QUT in 1994 having completed a Bachelor of Applied Science in Surveying. He was registered as a Cadastral Surveyor with the Surveyors Board of Queensland in 2009. Tony also achieved registration as a Licensed Surveyor with the Northern Territory Surveyors Board in 2010. Tony has over twenty years of private practice surveying experience, having worked in firms in Brisbane and the Sunshine Coast. During this time he has overseen various large scale projects in land development and high-rise building construction throughout Queensland. Tony has been a business owner on the Sunshine Coast since 2016. Tony is DSQ’s expert in complex land titling matters, including land subdivision, residential apartments, commercial and industrial development, mixed use and community title developments. Tony also assists with the management and compliance of land development to achieve survey plan sealing and title registration. Tony is the Director responsible for our South East Queensland operations and maintains a close involvement in land development, engineering and infrastructure projects for DSQ. Contact Tony to discuss the requirements for your next project.